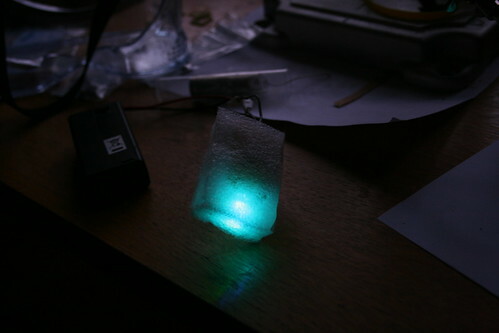 I've got the second prototype made for my LED Firefly idea. This one uses all through-the-hole components, compared to the entirely surface mounted first prototype. It's easier for others to assemble! However, the new prototype isn't without problems. It seems the photocopier merely flipped my image instead of mirroring it, so the ATtiny13 has to be inserted backwards. This means I can't really program it more than once, and bending the pins more than once breaks them. Oops! The other components are more lenient about which way they go in. 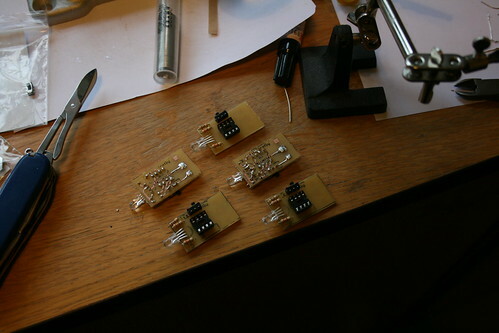 Second, I actually made it without ordering any 12mm batteries, so I can't power them via battery. I did solder a 2*AA battery box to one, which is nice but takes up a fair bit of space. I'd like to work out the best way to power these things. However, the basics do work right now - although my code still doesn't do light detection, which I need to work on - and it looks really good when encapsulated in some foam. 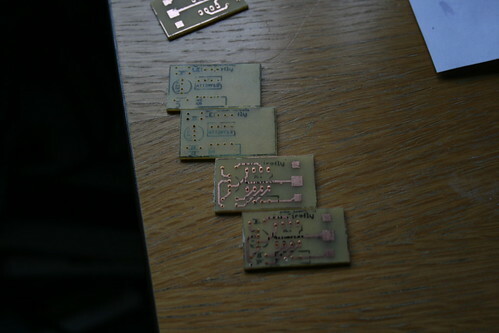 I think the next step will be to finish off the code and then get these things produced properly for some nice PCBs.